Nigeria international Ighodaro Osaguona has joined Moroccan side Raja Casablanca from Enugu Rangers on a four-year deal, for an undisclosed fee. A number of clubs were thought to be tracking the 24-year-old striker, but he was impressed with the perseverance of Raja officials and their ambition. "There were other options, but Raja are arguably the biggest club in Africa," the player's agent Jordan Wise told BBC Sport. "They regularly play in the African Champions League and want to go all out to be at the World Club championship this year. 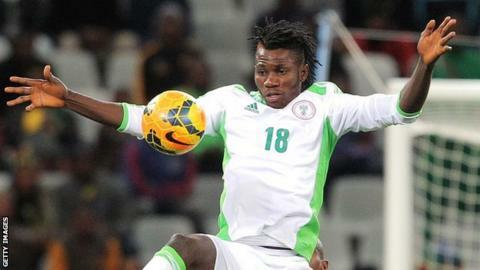 "Casablanca is a nice place, very close to Spain and I think it's a good stepping stone for Osaguona." Osaguona, who has been capped twice by Nigeria, scored 16 goals in the Nigeria Premier League last season and was linked with a move to the United Arab Emirates, Malaysia and China, but his representative insists three-time African Champions Raja provides him with a platform to develop. Wise added: "If you look at the journeys of top African players into Europe, there is always a process and it takes time. "This is Osaguona's first big move and the club offers another level for him to showcase his talent and take the next step at the appropriate time. "A club like Raja and his continued exposure with the Super Eagles is a perfect fit for progress we want for him."